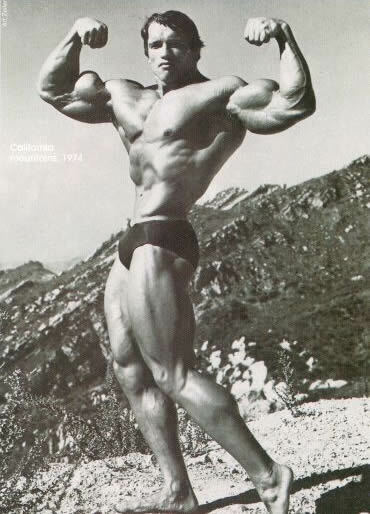 Pro body builders like Arnold Swarchenegger, Frank Zane and their contemporaries were the gods of body building in the mid-1970s. 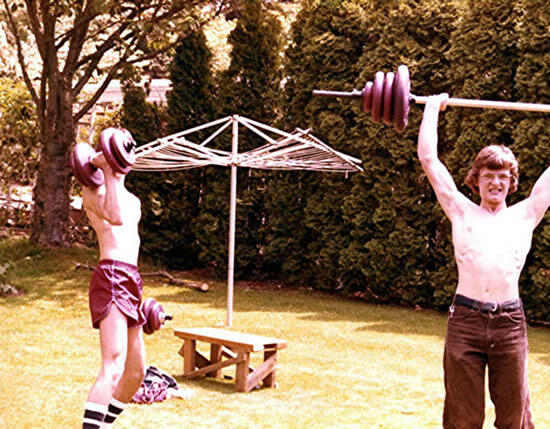 The whole sport of weight lifting had recently gained a degree of respect by 1974 and many young adults across North America, like myself, were starting to purchase gym memberships and weight lifting equipment and trained to get 'those big muscles' too. I remember getting into a fight with a school yard bully in grade 8 and going home afterwards and convincing my parents to help me purchase my own weight lifting set. I also bought some books on the subject and quickly set about designing a workout schedule and program to develop myself into a muscular teenager. I created a pulley system in the basement in order to train my pecks (chest) and lats (V-back) and also built a sturdy bench press. I ate tuna sandwiches for lunch and had protein powder shakes after workouts as well. Two of my best friends, Mark Thomson and William Yu were also bitten by the weight lifting bug and together we often trained at one of our homes, and also traveled to hear pro body builders talk at local gyms when they came to town. By grade 11 I was arguably one of the strongest kid in my high school, at least in terms of upper body strength, being able to bench press 275lbs while weighing 145lbs. Today strength training and muscle building is considered a critical element in any balanced fitness program (cross-training) yet many people that I talk to seem to hate weight lifting. I always loved it because it was the quickest way to change the look and feel of my body - by setting out a comprehensive workout program and schedule, within a few months you could look completely different. I have always been hooked. I am currently working towards a new goal of bench pressing 225lbs x 10 reps which would be a personal lifetime 'best' for me.